Another innovative dish from my Kitchen . 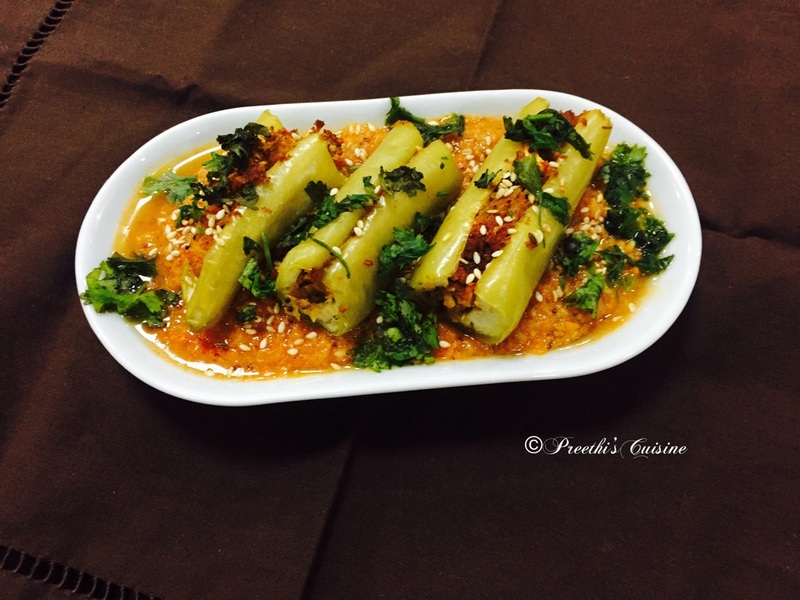 This recipe has been on my mind for some time now.It is a yummy dish which you will definitely not want to miss. A crowd pleaser for sure.My family just love Bajji chilli and burji so this combo was just mind blowing. Heat some oil in a pan. Add Jeera/ Cumin,onion and grated cauliflower. Roast till golden brown. Add Aachari masala /Pickle Masala and salt. Once done switch off the flame. Slit the Chilli ,cuti into 2 parts and deseed. Stuff the chillies with this Burji. Put them on a greased baking tray and place the tray in a pre-heated oven at 180C for 25 Mins.Once done keep it aside. Heat some oil in a pan. Add ginger and garlic paste. Saute for 2mins and add Onions.Roast the onions till golden brown. Add tomatoes and saute till they turn mushy. Add the soaked Cashews and almonds and saute for 2 mins. Allow it to cool. Once the mixture is cool blend to get a fine paste. Heat some oil in the same pan. Add Jeera/Cumin, Haldi/turmeric , chilli powder. Mix well. Add Sabji masala or Garam masala(I have only added sabji masala).Mix well again. Add the onion tomato mixture and mix well. Add salt to taste. Let the mixture simmer for 5 mins. Switch off the flame. 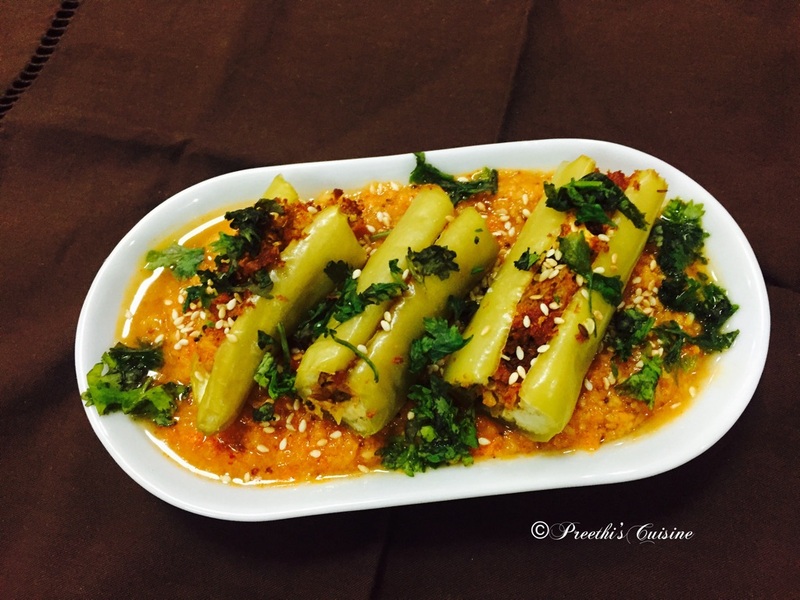 Awesome…I can taste it too…the chillies look divine preethi. Thank you. I am sure Zucchini stuff would have tasted yum too. lovely recipe. It sure would be a treat for those who love chillis. Will definitely try it out when I have a dinner party. 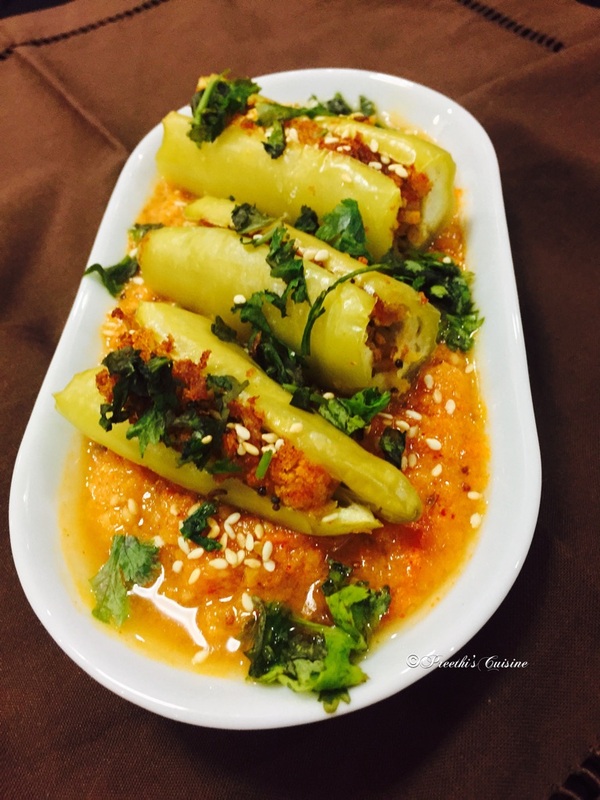 Looks very delicious and such a beautiful recipe shared by you..thanks for sharing ! !